The Simple Gas Laws study the effect of changing pressure, temperature and moles have on the variable of volume. Together all three Simple Gas Laws combine to give the Ideal Gas Law. Welcome back guys. In this new video, we get to take a look at the simple gas laws. Let's start it out. We're going to say that the first gas law states that at constant temperature, the volume occupied by a gas in a container is inversely proportional to its external pressure. What the heck does that mean? Inversely proportional just means that they're opposite of each other. What this is really saying is volume and pressure are opposites, meaning if one goes up, let's say our volume goes up, that means that our pressure goes down. If our volume goes down, then our pressure goes up. That's all inversely proportional means. We're going to say that the simple gas law that tells us this is Boyle's Law. If you want to see this visually, think of it like this. We have a container. Inside this container, we have this piston that pushes down. This piston represents pressure. Here we're going to say that the piston is not very low because there's not much pressure. We're going to say here pressure is very low, so pressure low. Now, all this space in here, all this free room in there is our volume. Because the pressure is low, our volume is very high. There's a lot of room. But let's say that I decide that I want to push down on this piston. I come in, wrap my hand around it and push down. Now the pressure increases because I'm pushing down on it. As a result, look at the volume now. Pressure here would be high, as a result, volume would be very low. Pressure and volume being opposite of each other, that's Boyle's Law. It's going to be important for you to remember these simple gas laws because professors can ask calculated questions on using Boyle's Law or they could just simply ask you a theory question, which simple gas law states that volume and pressure are opposites of each other, that they're inversely proportional. That would be an easy question to get correct, so just remember what it means. It means that pressure and volume are opposites of each other. Boyle’s Law states that pressure and volume are inversely proportional, which basically means they are opposites, at constant moles and temperature. The next simple gas law states that at constant pressure, the volume occupied by a gas in a container is directly proportional to its absolute Kelvin temperature. All this means is volume and your Kelvin temperature are directly related. If your volume increases, then your temperature is increasing. If your volume is decreasing, well, your temperature must be decreasing. We're going to say that this is known as Charles' Law. If we looked at a picture of this, so let's say we have a container. Here's the volume in the container. There's no heat being supplied to this container and as a result, the volume is low and the temperature is low. But let's say I take that same container and all of the sudden I light a match underneath it and heat it up. What happens here is there are gas particles here the whole time. When I heat them up, the gas particles are going to absorb this thermal energy from the match that I let. They absorb this thermal energy and use it as fuel to make the move, so they convert thermal energy to kinetic energy. So they have more energy so they're able to bounce off things faster and harder. They absorb this energy and they hit the top of this piston with more force, thereby pushing it up, so the piston slides up because the gases are hitting it harder. As a result, because I increase the temperature, I increase the kinetic energy of my gas particles which then increased the volume. That's how it works. That's Charles' Law. So I increased the temperature, so the temperature now is high, so volume becomes high. Remember the connection for this is because the gas particles absorb that thermal energy and change it to kinetic energy and use it to push the piston up, thereby increasing the volume. Charles Law states that volume and temperature are directly proportional if pressure and moles are constant. So if one is high then the other is high and vice versa. The next simple gas law states that at constant temperature and pressure, the volume of a gas is directly proportional to the amount moles of gas. Remember the SI unit for the amount of a substance is the mole. This law basically says that if my volume is increasing, it's because my moles are increasing. If my volume is decreasing, it's because my moles are decreasing. This is known as Avogadro's Law. Same guy from Avogadro's number. This makes sense. Let's say we had only three gas particles in here. There's not that many of them, so we don't need that much room. But let's say I started pumping in way more gas particles, naturally, if I have more gas particles, I need room for them because you can't squeeze all of them into that small little space. So what do I do? I just increase the volume to fit more people in there. Avogadro’s Law states that volume and moles are directly proportional at constant pressure and temperature. So if one is high then the other is high and vice versa. We're going to say that Boyle's Law, Charles' Law and Avogadro's Law, each of the gas laws focuses on the effects that changes in one variable can have on the volume of a gas. So these three guys are looking to see the effects that all of these changes have on the volume of a container. We're going to say altogether they combine to give us the Ideal Gas Law. This equation is going to be essential for our calculations dealing with gases. The Ideal Gas Law is PV = nRT. We're going to say that P here equals pressure in atmospheres. We're going to say V equals volume in liters. We're going to say that n equals our moles of the gas. T equals temperature in Kelvin. R equals our gas constant. From the name gas constant it means that it's a constant number, so it's going to be up to you guys to remember what that constant number is. R equals 0.08206. The units are liters times atmospheres over moles times K.
What you should realize is the units in R are what is telling us the other units for everyone else. The units we find in R dictate the units found in all the other units. Because R has liters, volume has to be in liters. Because R has atmospheres, pressure is in atmospheres. Moles, moles. And Kelvin, that's why temperature has to be in Kelvin. The units of R dictate the units of all the other variables. Usually, professors kind of skip this other gas law because it doesn't talk about the influences that we have on volume. It relates our pressure to our temperature, which is different. We're going to say in lab is where you usually see this simple gas law. Just make reference to this. You usually see this simple gas law in lab. Just remember what this one is because it could help you in lab when you're doing calculations or have to write a report. Here, this last gas law states that at constant volume and moles, the pressure exerted by a gas is directly proportional to the internal temperature of the container. Basically, what it's saying here, pressure and temperature, they're saying that if your pressure is increasing, it's because your temperature is increasing. If your pressure is decreasing, it's because your temperature is decreasing. Now, why is that? Let's think about it. Here we don't have any temperature at all and we have these three gas particles. The temperature is low, so the pressure is low. But I introduce a flame. We're saying that the volume stays constant, so the volume is not going to increase. The volume stays the same. We keep the volume the same. I increase the heat. The gas particles are going to absorb that thermal energy and use it as kinetic energy. They absorb that energy, they move faster. If they're moving faster, they're going to be hitting the walls of the container harder. Remember we said, back in the beginning, that pressure is force per area. If the gases are moving faster and hitting the walls harder, then the pressure is going to naturally increase. It can naturally increase because we're keeping the volume the same. This simple gas law is called the Gay-Lussac's Law. Gay-Lussac’s Law states that pressure and temperature are directly proportional at constant volume and moles. So if one is high then the other is high and vice versa. 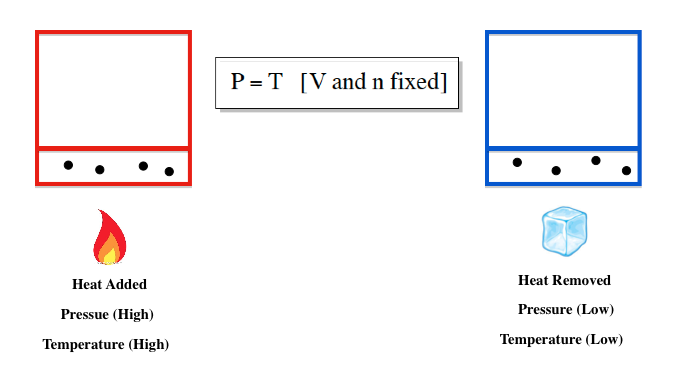 Sometimes we will be given two of the same variables such as volume, temperature, pressure or moles. In these cases, you will have to learn to manipulate the Ideal Gas Law to isolate the equation you need. Example #1: A sample of neon gas occupies 112 mL at 0.567atm. If the temperature remains constant, what is the volume (in L) at 1165 mmHg? 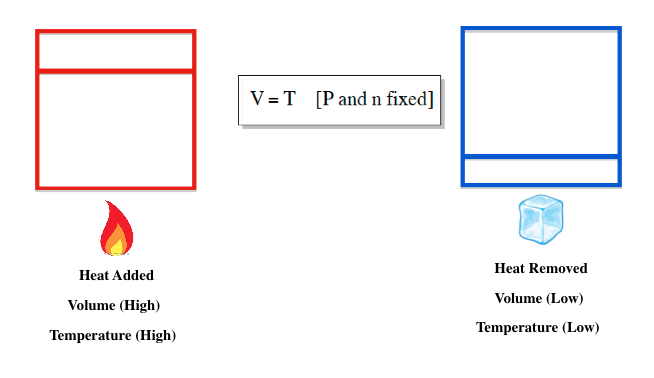 When manipulating the Ideal Gas Law you want your common set of variables on one side of your equation. Example #2: An engineer pumps air at 0 degrees C into a mechanized piston-cylinder engine. If the volume measures 7.18 cm3 what will the new temperature be at 12.3 mL? Manipulating the Ideal Gas Law can help us solve questions beyond our understanding of the Simple Gas Laws. Practice: A large plastic container holds 47.1 g of water vapor at a pressure of 1.12 atm. What is the new pressure if 12.1 g of water vapor is removed at constant temperature? If we are not given two of the same variables such as volume, temperature, pressure or moles then we just use the Ideal Gas Law. Practice: A steel tank has a volume of 592 L and is filled with 0.638 kg of hydrogen gas. Calculate the pressure of the gas if the temperature is 82oC. Welcome back guys. In this new video, we're going to attempt to relate the Ideal Gas Law to our old friend, stoichiometry. Let's take a look here at this first part. We say in the previous chapters, we encountered reactions that involved gases. So we might be talking about gases in greater detail now, but there have been times when we dealt with gases. The first time was when we had oxygen gas as a reactant. Remember, when did we see this? We saw this in combustion. Example we have CH4 reacting with O2 gas. That creates, remember combustion creates carbon dioxide as a gas plus water vapor. All we have to remember to do here is just balance out the equation. That would be an example where we dealt with gases in combustion. The second time when we dealt with gases in hydrogen displacement. Hydrogen displacement we have basically a metal reacting with an acid, HCl, HBr, or HI. The metal physically kicks out the hydrogen and hydrogen exists by itself as H2 gas. An example we have magnesium solid reacting with HCl aqueous. Magnesium comes in and kicks out the hydrogen. Remember, magnesium is going to connect with the chlorine. That's going to form an ionic compound because we're going to have a metal connected to a nonmetal. Remember for ionic compounds, we have to remember the charges. Magnesium is in group 2A, so it's plus two. Chlorine is in group 7A, so it's minus one. The two from here would come here, the one from here would move over here. We'd have MgCl2 aqueous plus, remember the hydrogen got kicked out and it can't exist by itself, so it exists as H2 gas. We just have to balance it by putting a two here and we're done. So this is hydrogen displacement. A metal physically kicks out hydrogen from a halogen. This could also happen with HBr, HI. They also would do hydrogen displacement. Now it's time for us to connect our Ideal Gas Law concepts that we've covered thus far plus the older concepts we learned about stoichiometry. We’ve dealt with gases on previous topics such as stoichiometry, where the gas was either a reactant or product. Now we can relate Stoichiometry to the Ideal Gas Law. For a stoichiometric question dealing with the Ideal Gas Law just focus on the KNOWN quantities and determine which portion of the ideal Gas Law you need to isolate. Example #3: Magnesium reacts with excess hydrochloric acid to form aqueous magnesium chloride and 26.7 mL of hydrogen gas at 25 degrees C and 723 mmHg. How many grams of magnesium reacted? When a gas is collected over water the total pressure is the partial pressures of the gas and of water vapor. To determine the correct answer you need to find the partial pressure of only the gas. The pressure of acetylene collected over water is 729 torr while the volume was measured as 629 mL. If at 21 degrees C the vapor pressure of the water is 29 torr, how many grams of acetylene were produced? 0.40 g of H2, 20.0 g CO2, and 14.00 g of O2 are placed into a 5.0 L container at 18°C. What is the partial pressure of CO2 gas and what is the total pressure in the container? Into a 500.0 L container at 18°C are placed 0.40 g of H 2, 20.0 g CO 2 and 14.0 g of O2. What is the partial pressure of H 2? What is the volume occupied by 12.5 g of argon gas at a pressure of 1.05 atm and a temperature of 322 K? Would the volume be different if the sample were 12.5 g of helium (under identical conditions)? A gas mixture with a total pressure of 745mmHg contains each of the following gases at the indicated partial pressures: CO2, 125 mmHg; Ar, 214 mmHg; and O2, 187 mmHg. The mixture also contains helium gas. What is the partial pressure of the helium gas? What mass of helium gas is present in a 12.0-L sample of this mixture at 273 K? A scuba divers tank contains 0.29 kg of O2 compressed into a volume of 2.3 L.What volume would this oxygen occupy at 26 oC and 0.95 atm ? A cylinder contains 29.0 L of oxygen gas at a pressure of 1.9 atm and a temperature of 305 K .How much gas (in moles) is in the cylinder? A steel container of volume 0.36 L can withstand pressures up to 89 atm before exploding.Find the mass of helium that can be stored in this container at 301 K .
Explain why people may experience ear pain after a rapid change in altitude. Explain why scuba divers should never hold their breath when they ascend to the surface. Why is it impossible to breathe air through an extra-long snorkel (longer than a couple of meters) while swimming under water? Review the ideal gas law. Without referring back to the text, use algebra to write the ideal gas law and solve for one of the variables.Using the Ideal Gas Law, solve for pressure. Naturally found uranium consists of 99.274%, 238U, 0.720% 235U, and 0.006% 233U (by mass). As we have seen, 235U is the isotope that can undergo a nuclear chain reaction. Most of the 235U used in the first atomic bomb was obtained by gaseous diffusion of uranium hexafluoride, UF6(g).What is the mass of UF6 in a 30.0-L vessel of UF6 at a pressure of 690 torr at 360 K? A gas mixture contains each of the following gases at the indicated partial pressures: N2, 221 torr ; O2, 131 torr ; and He, 131 torr .What mass of each gas is present in a 1.30 -L sample of this mixture at 25.0 oC? Assume that an exhaled breath of air consists of 74.7 % N2, 15.4 % O2, 3.8 % CO2, and 6.1 % water vapor.If the volume of the exhaled gas is 460 mL and its temperature is 37 oC, calculate the number of moles of CO2 exhaled. When 0.550 g of neon is added to an 750-cm3 bulb containing a sample of argon, the total pressure of the gases is found to be 1.46 atm at a temperature of 320 K .Find the mass of the argon in the bulb. A gas mixture contains 1.26 g N2 and 0.86 g O2 in a 1.56-L container at 18 oC.You want to reference (Pages 216 - 222) Section 5.6 while completing this problem.Calculate the partial pressure of N2. A gas mixture contains 1.26 g N2 and 0.86 g O2 in a 1.56-L container at 18 oC.You want to reference (Pages 216 - 222) Section 5.6 while completing this problem.Calculate the partial pressure of O2. A piece of solid carbon dioxide with a mass of 5.60 g is placed in a 10.0-L vessel that already contains air at 710 torr and 24 oC.After the carbon dioxide has totally vaporized, what is the partial pressure of carbon dioxide in the container at 24 oC? A sample of 3.10 g of SO2 (g) originally in a 5.20-L vessel at 26 oC is transferred to a 12.0-L vessel at 25 oC. A sample of 2.40 g N2 (g) originally in a 2.60-L vessel at 20 oC is transferred to this same 12.0-L vessel.What is the partial pressure of SO2 (g) in the larger container? A sample of 3.10 g of SO2 (g) originally in a 5.20-L vessel at 26 oC is transferred to a 12.0-L vessel at 25 oC. A sample of 2.40 g N2 (g) originally in a 2.60-L vessel at 20 oC is transferred to this same 12.0-L vessel.What is the partial pressure of N2 (g) in this vessel? A 1.25 -g sample of dry ice is added to a 765 -mL flask containing nitrogen gas at a temperature of 25.0 oC and a pressure of 735 mm Hg . The dry ice is allowed to sublime (convert from solid to gas) and the mixture is allowed to return to 25.0 oC.What is the total pressure in the flask? Calculate the pressure exerted by 1.00 mol of an ideal gas in a box that is 0.300 L and 298 K.
A piece of solid carbon dioxide with a mass of 5.60 g is placed in a 10.0-L vessel that already contains air at 710 torr and 24 oC.After the carbon dioxide has totally vaporized, what is the total pressure in the container at 24 oC? A sample of 3.10 g of SO2 (g) originally in a 5.20-L vessel at 26 oC is transferred to a 12.0-L vessel at 25 oC. A sample of 2.40 g N2 (g) originally in a 2.60-L vessel at 20 oC is transferred to this same 12.0-L vessel.What is the total pressure in the vessel? In Sample Exercise 10.16 in the textbook, we found that one mole of Cl2 confined to 22.41 L at 0 oC deviated slightly from ideal behavior. Calculate the pressure exerted by 1.00 mol Cl2 confined to a smaller volume, 6.00 L , at 25 oC.Use the ideal gas equation. To minimize the rate of evaporation of the tungsten filament, 1.5×10−5 mol of argon is placed in a 600- cm3 lightbulb.What is the pressure of argon in the lightbulb at 24 oC? Carbon dioxide, which is recognized as the major contributor to global warming as a "greenhouse gas," is formed when fossil fuels are combusted, as in electrical power plants fueled by coal, oil, or natural gas. One potential way to reduce the amount of CO2 added to the atmosphere is to store it as a compressed gas in underground formations. Consider a 1000-megawatt coal-fired power plant that produces about 6×106 tons of CO2 per year.Assuming ideal gas behavior, 1.00 atm, and 37 oC, calculate the volume of CO2 produced by this power plant. Carbon dioxide, which is recognized as the major contributor to global warming as a "greenhouse gas," is formed when fossil fuels are combusted, as in electrical power plants fueled by coal, oil, or natural gas. One potential way to reduce the amount of CO2 added to the atmosphere is to store it as a compressed gas in underground formations. Consider a 1000-megawatt coal-fired power plant that produces about 6×106 tons of CO2 per year.If the CO2 is stored underground as a liquid at 10 oC and 120 atm and a density of 1.2 g/cm3, what volume does it possess? A wine-dispensing system uses argon canisters to pressurize and preserve wine in the bottle. An argon canister for the system has a volume of 59.6 mL and contains 30.1 g of argon.Assuming ideal gas behavior, what is the pressure in the canister at 297 K ? Large amounts of nitrogen gas are used in the manufacture of ammonia, principally for use in fertilizers. Suppose 130.00 kg of N2(g) is stored in a 1400.0 L metal cylinder at 290 oC.Calculate the pressure of the gas, assuming ideal-gas behavior. What volume of air contains 12.6 g of oxygen gas at 273 K and 1.00 atm? What volume is occupied by 0.105 mol of helium gas at a pressure of 0.96 atm and a temperature of 306 K ? What is the pressure in a 13.0-L cylinder filled with 0.500 mol of nitrogen gas at a temperature of 315 K ? What is the pressure in a 21.0-L cylinder filled with 40.1 g of oxygen gas at a temperature of 331 K ? A piece of dry ice (solid carbon dioxide) with a mass of 28.5 g sublimes (converts from solid to gas) into a large balloon.Assuming that all of the carbon dioxide ends up in the balloon, what is the volume of the balloon at 23 oC and a pressure of 746 mmHg ? Twenty-five milliliters of liquid nitrogen (density = 0.807 g/mL) is poured into a cylindrical container with a radius of 11.6 cm and a length of 19.6 cm . The container initially contains only air at a pressure of 760.0 mmHg (atmospheric pressure) and a temperature of 298 K .If the liquid nitrogen completely vaporizes, what is the total force (in lb) on the interior of the container at 298 K ? A 12.1-mL sample of liquid butane (density = 0.573 g/mL) is evaporated in an otherwise empty container at a temperature of 28.6 oC. The pressure in the container following evaporation is 890 torr .What is the volume of the container? Room temperature is often assumed to be 25oC. Calculate the molar volume of an ideal gas at 25oC and 1 atm pressure. A mixture of oxygen gas, nitrogen gas, and carbon dioxide in a 10.0 L container at 25°C has a total pressure of 12.5 atm. If there are 30.0 g each of oxygen and nitrogen, how many grams of carbon dioxide are present? A 118-mL flask is evacuated and found to have a mass of 97.129 g. When the flask is filled with 768 torr of helium gas at 35 °C, it has a mass of 97.171 g. Was the helium gas pure? Carbon dioxide makes up approximately 0.04% of Earths atmosphere. If you collect a 2.6 L sample from the atmosphere at sea level (1.00 atm) on a warm day (28 oC), how many CO2 molecules are in your sample? A 1.00 L flask is filled with 1.05 g of argon at 25 °C . A sample of ethane vapor is added to the same flask until the total pressure is 1.450 atm. What is the partial pressure of argon, PAr , in the flask? What is the partial pressure of ethane, Pethane, in the flask? What pressure will 14.0 g of CO exert in a 3.5 L container at 75 degrees Celsius? A 1.00 L flask is filled with 1.20g of argon at 25°C. A sample of ethane vapor is added to the same flask until the total pressure is 1.400atm .a. What is the partial pressure of argon, PAr, in the flask?b. What is the partial pressure of ethane, Pethane, in the flask? A person inhales air richer in O2 and exhales air richer in CO2 and water vapor. During each hour of sleep, a person exhales a total of about 300 L of this CO2-enriched and H2O-enriched air.C6H12O6(s) + 6O2(g) ⟶6CO2(g) + 6H2O(g)(a) If the partial pressures of CO2 and H2O in exhaled air are each 30.0 torr at 37.0°C, calculate the mass (g) of CO2 and of H2O exhaled in 1 h of sleep. A 1.00 L flask is filled with 1.00 g of argon at 25 °C. A sample of ethane vapor is added to the same flask until the total pressure is 1.250 atm. i) What is the partial pressure of argon, PAr, in the flask? Express your answer to three significant figures and include the appropriate units. ii) What is the partial pressure of ethane, Pethane, in the flask? Express your answer to three significant figures and include the appropriate units. What is the pressure in a 15.0-L cylinder filled with 32.7 g of oxygen gas at a temperature of 302 K? What is the temperature of 0.52 mol of gas at a pressure of 1.3 atm and a volume of 11.8 L? How many moles of CO are contained in a 5.00 L tank at 155 °C and at 2.80 atm? Into a 5.00 L container at 18oC are placed 0.200 mol H2, 20.0 g CO2, and 14.00 g O2. Calculate the total pressure in the container and the partial pressure of each gas. What mass of NO2 is contained in a 13.0 L tank at 4.58 atm and 385 K? A 1.20-g sample of dry ice is added to a 755-mL flask containing nitrogen gas at a temperature of 25.0 °C and a pressure of 725 mmHg. The dry ice sublimes (converts from solid to gas) and the mixture returns to 25.0 °C. What is the total pressure in the flask? The air in a bicycle tire is bubbled through water and collected at 25 °C. If the total volume of gas collected is 5.45 L at a temperature of 25°C and a pressure of 745 torr, how many moles of gas were in the bicycle tire? For each of the items written below, state why it is wrong and write a version that is correct. What’s wrong?Write a correct version. Blimps, which frequently fly over sporting events, hold approximately 1.75×105 ft3 of helium.If the gas is at 25 oC and 1.0 atm, what mass of helium is in the blimp? At a height of 300 km above Earth’s surface, an astronaut finds that the atmospheric pressure is about 10−8 mmHg and the temperature is 500 K. How many molecules of gas are there per milliliter at this altitude? A 334-mL cylinder for use in chemistry lectures contains 5.257 g of helium at 23˚C.How many grams of helium must be released to reduce the pressure to 65 atm assuming ideal gas behavior? Complete the following table for an ideal gas: P V n T 2.10 atm 1.30 L0.510 mol? K0.320 atm0.260 L? mol32 oC660 torr? L0.334 mol360 K? atm585 mL0.260 mol290 KComplete the second row of the table. Calculate each of the following quantities for an ideal gas.Calculate the quantity of gas, in moles, if 127 L at 56.0 oC has a pressure of 11.25 kPa . Calculate the number of molecules in a deep breath of air whose volume is 2.30 L at body temperature, 37 oC, and a pressure of 740 torr. The adult blue whale has a lung capacity of 5.0 x 103 L. Calculate the mass of air (assume an average molar mass 28.98 g/mol) contained in an adult blue whale’s lungs at 0.3 oC and 1.06 atm, assuming the air behaves ideally. If the pressure exerted by ozone, O3, in the stratosphere is 3.0 x 10 -3 atm and the temperature is 251 K , how many ozone molecules are in a liter? Chlorine is widely used to purify municipal water supplies and to treat swimming pool water. Suppose that the volume of a particular sample of Cl2 gas is 8.70 L at 895 torr and 24 oC.How many grams of Cl2 are in the sample? Many water treatment plants use chlorine gas to kill microorganisms before the water is released for residential use. A plant engineer has to maintain the chlorine pressure in a tank below the 85.0-atm rating and, to be safe, decides to fill the tank to 80.0% of this maximum pressure. (a) How many moles of Cl2 gas can be kept in an 850.-L tank at 298 K if she uses the ideal gas law in the calculation? Many gases are shipped in high-pressure containers. Consider a steel tank whose volume is 55.0 gallons and which contains O2 gas at a pressure of 16,500 kPa at 24 oC.What mass of O2 does the tank contain? Standard conditions are based on relevant environmental conditions. If normal average surface temperature and pressure on Venus are 730. K and 90 atm, respectively, what is the standard molar volume of an ideal gas on Venus? The partial pressure of CH4(g) is 0.175 atm and that of O2(g) is 0.250 atm in a mixture of the two gases.b. If the mixture occupies a volume of 10.5 L at 65°C, calculate the total number of moles of gas in the mixture. The partial pressure of CH4(g) is 0.175 atm and that of O2(g) is 0.250 atm in a mixture of the two gases.a. What is the mole fraction of each gas in the mixture?b. If the mixture occupies a volume of 10.5 L at 65°C, calculate the total number of moles of gas in the mixture.c. Calculate the number of grams of each gas in the mixture. The vapor pressure of water at 25 oC is 23.76 torr. If 1.30 g of water is enclosed in a 2.0-L container, will any liquid be present? The vapor pressure of CCl3F at 300 K is 856 torr. If 12.5 g of CCl3 F is enclosed in a 1.2 L container, calculate the number of moles of CCl3F in the gas phase. Air conditioners not only cool air, but dry it as well. Suppose that a room in a home measures 7.0 m x 10.0 m x 2.7 m. If the outdoor temperature is 30 oC and the vapor pressure of water in the air is 85 % of the vapor pressure of water at this temperature, what mass of water must be removed from the air each time the volume of air in the room is cycled through the air conditioner? The vapor pressure for water at 30 oC is 31.8 torr. How many liters of gaseous hydrogen bromide at 29°C and 0.965 atm will a chemist need if she wishes to prepare 3.50 L of 1.20 M hydrobromic acid? How many liters of HCl gas, measured at 30.0 °C and 745 torr, are required to prepare 1.25 L of a 3.20-M solution of hydrochloric acid? Propane, C3H8, liquefies under modest pressure, allowing a large amount to be stored in a container. Calculate the number of moles of propane gas in a 120-L container at 3.10 atm and 27 oC. Analysis of a newly discovered gaseous silicon-fluorine compound shows that it contains 33.01 mass % silicon. At 27°C, 2.60 g of the compound exerts a pressure of 1.50 atm in a 0.250-L vessel. What is the molecular formula of the compound? The average lung capacity of a human is 6.0 L. How many moles of air are in your lungs when you are in the followingsituations?a. At sea level (T = 298 K, P = 1.00 atm). The average lung capacity of a human is 6.0 L. How many moles of air are in your lungs when you are in the followingsituations?b. 10. m below water (T = 298 K, P = 1.97 atm). The average lung capacity of a human is 6.0 L. How many moles of air are in your lungs when you are in the followingsituations?c. At the top of Mount Everest (T = 200. K, P = 0.296 atm). The steel reaction vessel of a bomb calorimeter, which has a volume of 75.0 mL, is charged with oxygen gas to a pressure of 14.5 atm at 22°C. Calculate the moles of oxygen in the reaction vessel. Nickel carbonyl, Ni(CO)4 is one of the most toxic substances known. The present maximum allowable concentration in laboratory air during an 8-hr workday is 1 ppb (parts per billion) by volume, which means that there is one mole of Ni(CO)4 for every 109 moles of gas. Assume 24 oC and 1.00 atm pressure. What mass of Ni(CO)4 is allowable in a laboratory that is 14ft x 22ft x 11ft? An aerospace manufacturer is building a prototype experimental aircraft that cannot be detected by radar. Boron nitride is chosen for incorporation into the body parts, and the boric acid/ammonia method is used to prepare the ceramic material. Given 85.5% and 86.8% yields for the two reaction steps, how much boron nitride can be prepared from 1.00 metric ton of boric acid and 12.5 m3 of ammonia at 275 K and 3.07 x 103 kPa? Assume that ammonia does not behave ideally under these conditions and is recycled completely in the reaction process. Olympic cyclists fill their tires with helium to make them lighter. Assume that the volume of the tire is 860 mL , that it is filled to a total pressure of 125 psi , and that the temperature is 25 oC. Also, assume an average molar mass for air of 28.8 g/mol.Calculate the mass of air in an air-filled tire. Olympic cyclists fill their tires with helium to make them lighter. Assume that the volume of the tire is 860 mL , that it is filled to a total pressure of 125 psi , and that the temperature is 25 oC. Also, assume an average molar mass for air of 28.8 g/mol.What is the mass difference between the two? Olympic cyclists fill their tires with helium to make them lighter. Assume that the volume of the tire is 860 mL , that it is filled to a total pressure of 125 psi , and that the temperature is 25 oC. Also, assume an average molar mass for air of 28.8 g/mol.Calculate the mass of helium in a helium-filled tire. A gas sample containing 1.50 moles at 25°C exerts a pressure of 400. torr. Some gas is added to the same container and the temperature is increased to 50.°C. If the pressure increases to 800. torr, how many moles of gas were added to the container? Assume a constant-volume container. Popcorn pops because the horny endosperm, a tough, elastic material, resists gas pressure within the heated kernel until the pressure reaches explosive force. A 0.25-mL kernel has a water content of 1.6% by mass, and the water vapor reaches 170°C and 9.0 atm before the kernel ruptures. Assume that water vapor can occupy 75% of the kernel’s volume. (a) What is the mass (in g) of the kernel? Atmospheric scientists often use mixing ratios to express the concentrations of trace compounds in air. Mixing ratios are often expressed as ppmv (parts per million volume):On a certain November day, the concentration of carbon monoxide in the air in downtown Denver, Colorado, reached 3.0 x 102 ppmv. The atmospheric pressure at that time was 628 torr and the temperature was 0°C.b. What was the concentration of CO in molecules per cubic meter? In the average adult male, the residual volume (RV) of the lungs, the volume of air remaining after a forced exhalation, is 1200 mL. (a) How many moles of air are present in the RV at 1.0 atm and 37°C? Atmospheric scientists often use mixing ratios to express the concentrations of trace compounds in air. Mixing ratios are often expressed as ppmv (parts per million volume):On a certain November day, the concentration of carbon monoxide in the air in downtown Denver, Colorado, reached 3.0 x 102 ppmv. The atmospheric pressure at that time was 628 torr and the temperature was 0°C.c. What was the concentration of CO in molecules per cubic centimeter? In the average adult male, the residual volume (RV) of the lungs, the volume of air remaining after a forced exhalation, is 1200 mL. (a) How many moles of air are present in the RV at 1.0 atm and 37°C? (b) How many molecules of gas are present under these conditions? A sample of chlorine gas is confined in a 5.0-L container at 328 torr and 37°C. How many moles of gas are in the sample? You have 357 mL of chlorine trifluoride gas at 699 mmHg and 45°C. What is the mass (in g) of the sample? Nitrogen oxide is a pollutant in the lower atmosphere that irritates the eyes and lungs and leads to the formation of acid rain. Nitrogen oxide forms naturally in atmosphere according to the endothermic reaction: N2(g) + O2(g) ⇌ 2NO(g); Kp = 4.1 x 10–31 at 298 KUse the ideal gas law to calculate the concentrations of nitrogen and oxygen present in air at a pressure of 1.0 atm and a temperature of 298 K. Assume that nitrogen comprises 78% of air by volume and that oxygen comprises 21%. An environmental chemist sampling industrial exhaust gases from a coal-burning plant collects a CO2-SO2-H2O mixture in a 21-L steel tank until the pressure reaches 850 torr at 45°C. (a) How many moles of gas are collected? An anesthetic gas contains 64.81% carbon, 13.60% hydrogen, and 21.59% oxygen, by mass. If 2.00 L of the gas at 25°C and 0.420 atm weighs 2.57 g, what is the molecular formula of the anesthetic? A compressed gas cylinder contains 1.00 x 103 g argon gas. The pressure inside the cylinder is 2050. psi (pounds per square inch) at a temperature of 18°C. How much gas remains in the cylinder if the pressure is decreased to 650. psi at a temperature of 26°C? A truck tire has a volume of 218 L and is filled with air to 35.0 psi at 295 K. After a drive, the air heats up to 318 K. (c) If the tire leaks 1.5 g of air per minute and the temperature is constant, how many minutes will it take for the tire to reach the original pressure of 35.0 psi (ℳ of air = 28.8 g/mol)? The world burns approximately 3.7 x 1012 kg of fossil fuel per year.By what percentage does the concentration increase each year due to fossil fuel combustion? Approximate the average properties of the entire atmosphere by assuming that the atmosphere extends from sea level to 15 km and that it has an average pressure of 381 torr and average temperature of 275 K. Assume Earth is a perfect sphere with a radius of 6371 km. Many water treatment plants use chlorine gas to kill microorganisms before the water is released for residential use. A plant engineer has to maintain the chlorine pressure in a tank below the 85.0-atm rating and, to be safe, decides to fill the tank to 80.0% of this maximum pressure. (a) How many moles of Cl2 gas can be kept in an 850.-L tank at 298 K if she uses the ideal gas law in the calculation? (b) What is the tank pressure if she uses the van der Waals equation for this amount of gas? (c) Did the engineer fill the tank to the desired pressure? A gas mixture with a total pressure of 760 mmHg contains each of the following gases at the indicated partial pressures: 126 mmHg CO2, 220 mmHg Ar, and 188 mmHg O2. The mixture also contains helium gas.What mass of helium gas is present in a 12.6-L sample of this mixture at 274 K ? Naturally found uranium consists of 99.274%, 238U, 0.720% 235U, and 0.006% 233U (by mass). As we have seen, 235U is the isotope that can undergo a nuclear chain reaction. Most of the 235U used in the first atomic bomb was obtained by gaseous diffusion of uranium hexafluoride, UF6(g). (a) What is the mass of UF6 in a 30.0-L vessel of UF6 at a pressure of 695 torr at 350 K? (b) What is the mass of 235U in the sample described in part a? The atomic mass of uranium-235 is 235.044 u. Breathing air that contains 4.0% by volume CO2 over time causes rapid breathing, throbbing headache, and nausea, among other symptoms.What is the concentration of CO2 in such air in terms of molarity, assuming 1 atm pressure and a body temperature of 37 oC? A plasma-screen TV contains thousands of tiny cells filled with a mixture of Xe, Ne, and He gases that emits light of specific wavelengths when a voltage is applied. A particular plasma cell, 0.900mm x 0.300mm x 10.0mm, contains 4.00% Xe in a 1:1 Ne:He mixture at a total pressure of 500. torr. Assumptions: In order to calculate total moles of gas and total atoms, we assumed a reasonable room temperature. Since 4.00% Xe was not defined, we conveniently assumed mole percent. The 1:1 relationship of Ne to He is assumed to be by volume and not by mass.Calculate the number of Xe atoms in the cell. A plasma-screen TV contains thousands of tiny cells filled with a mixture of Xe, Ne, and He gases that emits light of specific wavelengths when a voltage is applied. A particular plasma cell, 0.900mm x 0.300mm x 10.0mm, contains 4.00% Xe in a 1:1 Ne:He mixture at a total pressure of 500. torr. Assumptions: In order to calculate total moles of gas and total atoms, we assumed a reasonable room temperature. Since 4.00% Xe was not defined, we conveniently assumed mole percent. The 1:1 relationship of Ne to He is assumed to be by volume and not by mass.Calculate the number of Ne atoms in the cell. A plasma-screen TV contains thousands of tiny cells filled with a mixture of Xe, Ne, and He gases that emits light of specific wavelengths when a voltage is applied. A particular plasma cell, 0.900mm x 0.300mm x 10.0mm, contains 4.00% Xe in a 1:1 Ne:He mixture at a total pressure of 500. torr. Assumptions: In order to calculate total moles of gas and total atoms, we assumed a reasonable room temperature. Since 4.00% Xe was not defined, we conveniently assumed mole percent. The 1:1 relationship of Ne to He is assumed to be by volume and not by mass.Calculate the number of He atoms in the cell. A 6.0-L flask contains a mixture of methane (CH4), argon, and helium at 45°C and 1.75 atm. If the mole fractions of helium and argon are 0.25 and 0.35, respectively, how many molecules of methane are present? A sample of hydrogen gas is mixed with water vapor. The mixture has a total pressure of 755 torr , and the water vapor has a partial pressure of 26 torr . What amount (in moles) of hydrogen gas is contained in 1.67 L of this mixture at 298 K? At 1450. mmHg and 286 K, a skin diver exhales a 208-mL bubble of air that is 77 % N2, 17% O2, and 6.0% CO2 by volume. (b) How many moles of N2 are in the bubble? A 355-mL container holds 0.146 g of Ne and an unknown amount of Ar at 35°C and a total pressure of 626 mmHg. Calculate the number of moles of Ar present. A sample of air contains 78.08% nitrogen, 20.94% oxygen, 0.05% carbon dioxide, and 0.93% argon, by volume. How many molecules of each gas are present in 1.00 L of the sample at 25°C and 1.00 atm? A 275 mL gas sample contains argon and nitrogen at a temperature of 65 oC. The total pressure of the sample is 725 mmHg and the partial pressure of argon is 231 mmHg.What mass of nitrogen is present in the sample? What pressure (in atm) will 0.44 moles of CO2 exert in a 2.6 L container at 25oC? A rigid vessel containing a 3:1 mol ratio of carbon dioxide and water vapor is held at 210˚C where it has a total pressure of 2.10 atm. If the vessel is cooled to 10˚C so that all of the water vapor condenses, what is the pressure of carbon dioxide? Neglect the volume of the liquid water that forms on cooling. A piece of solid carbon dioxide, with a mass of 7.8 g, is placed in a 4.0-L otherwise empty container at 27°C. What is the pressure in the container after all the carbon dioxide vaporizes? If 7.8 g solid carbon dioxide were placed in the same container but it already contained air at 740 torr, what would be the partial pressure of carbon dioxide and the total pressure in the container after the carbon dioxide vaporizes? A mixture of 1.00 g H2 and 1.00 g He is placed in a 1.00-L container at 27°C. Calculate the partial pressure of each gasand the total pressure. At 0°C a 1.0-L flask contains 5.0 x 10-2 mole of N2, 1.5 x 102 mg O2, and 5.0 x 1021 molecules of NH3. What is thepartial pressure of each gas, and what is the total pressure in the flask? A commercial mercury vapor analyzer can detect, in air, concentrations of gaseous Hg atoms (which are poisonous) as low as 2 × 10−6 mg/L of air. At this concentration, what is the partial pressure of gaseous mercury if the atmospheric pressure is 733 torr at 26 °C? A mixture containing 0.768 mol He(g), 0.286 mol Ne(g), and 0.116 mol Ar(g) is confined in a 10.00-L vessel at 25 oC.Calculate the partial pressure of He in the mixture. A mixture containing 0.768 mol He(g), 0.286 mol Ne(g), and 0.116 mol Ar(g) is confined in a 10.00-L vessel at 25 oC.Calculate the partial pressure of Ne in the mixture. A mixture containing 0.768 mol He(g), 0.286 mol Ne(g), and 0.116 mol Ar(g) is confined in a 10.00-L vessel at 25 oC.Calculate the partial pressure of Ar in the mixture. A sample of 5.30 mL of diethylether (C2H5OC2H5; density = 0.7134g/mL) is introduced into a 6.30 L vessel that already contains a mixture of N2 and O2, whose partial pressures are PN2 =0.752 atm and PO2 =0.208 atm. The temperature is held at 35.0oC, and the diethylether totally evaporates.Calculate the partial pressure of the diethylether. In an experiment, 5.00 L of N 2 is saturated with water vapor at 22°C and then compressed to half its volume at constant T. What is the partial pressure of H2O in the compressed gas mixture? Gases such as CO are gradually oxidized in the atmosphere, not by O 2 but by the hydroxyl radical, ·OH, a species with one fewer electron than a hydroxide ion. At night, the ·OH concentration is nearly zero, but it increases to 2.5×1012 molecules/m3 in polluted air during the day. At daytime conditions of 1.00 atm and 22°C, what is the partial pressure and mole percent of ·OH in air? A gas mixture in a 1.55 L at 301 K container contains 10.0 g of Ne and 10.0 g of Ar.Calculate the partial pressure (in atm) of Ne and Ar in the container. In a certain experiment, magnesium boride (Mg 3B2) reacted with acid to form a mixture of four boron hydrides (BxHy), three as liquids (labeled I, II, and III) and one as a gas (IV). (a) When a 0.1000-g sample of each liquid was transferred to an evacuated 750.0-mL container and volatilized at 70.00°C, sample I had a pressure of 0.05951 atm; sample II, 0.07045 atm; and sample III, 0.05767 atm. What is the molar mass of each liquid? After 0.600 L of Ar at 1.20 atm and 227°C is mixed with 0.200 L of O 2 at 501 torr and 127°C in a 400-mL flask at 27°C, what is the pressure in the flask? A 35.3 g sample of solid CO2 (dry ice) is added to a container at a temperature of 100 K with a volume of 4.2 L.If the container is evacuated (all of the gas removed), sealed, and then allowed to warm to room temperature T = 298 K so that all of the solid CO2 is converted to a gas, what is the pressure inside the container? Complete the following table for an ideal gas: P V n T 2.10 atm 1.30 L0.510 mol? K0.320 atm0.260 L? mol32 oC660 torr? L0.334 mol360 K? atm585 mL0.260 mol290 KComplete the first row of the table. Complete the following table for an ideal gas: P V n T 2.10 atm 1.30 L0.510 mol? K0.320 atm0.260 L? mol32 oC660 torr? L0.334 mol360 K? atm585 mL0.260 mol290 KComplete the third row of the table. A spherical glass container of unknown volume contains helium gas at 25°C and 1.960 atm. When a portion of the helium is withdrawn and adjusted to 1.00 atm at 25°C, it is found to have a volume of 1.75 cm3. The gas remaining in the first container shows a pressure of 1.710 atm. Calculate the volume of the spherical container. Calculate each of the following quantities for an ideal gas.Calculate the volume of the gas, in liters, if 1.60 mol has a pressure of 1.26 atm at a temperature of -5 oC. Calculate each of the following quantities for an ideal gas.Calculate the absolute temperature of the gas at which 3.43×10−3 mol occupies 478 mL at 755 torr . Calculate each of the following quantities for an ideal gas.Calculate the pressure, in atmospheres, if 2.65×10−3 mol occupies 414 mL at 136 oC. For the reactionPCl5(g) ⇌ PCl3(g) + Cl2(g)at 600. K, the equilibrium constant, Kp, is 11.5. Suppose that 2.450 g PCl 5 is placed in an evacuated 500.-mL bulb, which is then heated to 600. K.a. What would be the pressure of PCl 5 if it did not dissociate? As 1 g of the radioactive element radium decays over 1 year, it produces 1.16 × 1018 alpha particles (helium nuclei). Each alpha particle becomes an atom of helium gas. What is the pressure in pascal of the helium gas produced if it occupies a volume of 125 mL at a temperature of 25 °C? An aerosol spray can with a volume of 250 mL contains 2.30 g of propane gas (C3H8) as a propellant.If the can is at 24 oC, what is the pressure in the can? An aerosol spray can with a volume of 250 mL contains 2.30 g of propane gas (C3H8) as a propellant.The can says that exposure to temperatures above 130 oF may cause the can to burst. What is the pressure in the can at this temperature? What is the temperature of 0.53 mol of gas at a pressure of 1.3 atm and a volume of 11.6 L ? Many gases are shipped in high-pressure containers. Consider a steel tank whose volume is 55.0 gallons and which contains O2 gas at a pressure of 16,500 kPa at 24 oC.At what temperature would the pressure in the tank equal 155.0 atm? The thermal decomposition of ethylene occurs during the compound’s transit in pipelines and during the formation of polyethylene. The decomposition reaction isCH2=CH2(g) ⟶ CH4(g) + C(graphite)If the decomposition begins at 10°C and 50.0 atm with a gas density of 0.215 g/mL and the temperature increases by 950 K, (a) What is the final pressure of the confined gas (ignore the volume of graphite and use the van der Waals equation)? Use the ideal gas equation to calculate the pressure exerted by 1.255 mol of Cl2 in a volume of 5.005 L at a temperature of 273.5 K .
To study a key fuel-cell reaction, a chemical engineer has 20.0-L tanks of H 2 and of O2 and wants to use up both tanks to form 28.0 mol of water at 23.8°C. (a) Use the ideal gas law to find the pressure needed in each tank. A sealed flask contains 0.55 g of water at 28 oC. The vapor pressure of water at this temperature is 28.36 mmHg. What is the minimum volume of the flask in order that no liquid water be present in the flask? A weather balloon containing 600. L of He is released near the equator at 1.01 atm and 305 K. It rises to a point where conditions are 0.489 atm and 218 K and eventually lands in the northern hemisphere under conditions of 1.01 atm and 250 K. If one-fourth of the helium leaked out during this journey, what is the volume (in L) of the balloon at landing? A mixture containing 0.768 mol He(g), 0.286 mol Ne(g), and 0.116 mol Ar(g) is confined in a 10.00-L vessel at 25 oC.Calculate the total pressure of the mixture. A sample of 5.30 mL of diethylether (C2H5OC2H5; density = 0.7134g/mL) is introduced into a 6.30 L vessel that already contains a mixture of N2 and O2, whose partial pressures are PN2 =0.752 atm and PO2 =0.208 atm. The temperature is held at 35.0oC, and the diethylether totally evaporates.Calculate the total pressure in the container. An 8.55 L tire contains 0.551 mol of gas at a temperature of 312 K .What is the pressure (in atm) of the gas in the tire? Propane, C3H8, liquefies under modest pressure, allowing a large amount to be stored in a container. (a) Calculate the number of moles of propane gas in a 110-L container at 3.00 atm and 27 °C. (b) Calculate the number of moles of liquid propane that can be stored in the same volume if the density of the liquid is 0.590 g/mL. What volume does 0.552 mol of gas occupy at a pressure of 716 mmHg at 56 oC? Calculate the pressure exerted by 0.5000 mole of N2 in a 1.0000-L container at 25.0°Ca. using the ideal gas law. Determine the pressure in mmHg of a 0.134 g sample of helium gas in a 647 mL container at 36 oC. A 5.0-L flask contains 0.60 g O2 at a temperature of 22°C. What is the pressure (in atm) inside the flask? A 2.50-L container is filled with 175 g argon.a. If the pressure is 10.0 atm, what is the temperature? Calculate the pressure exerted by 0.5000 mole of N2 in a 10.000-L container at 25.0°Ca. using the ideal gas law. A 2.50-L container is filled with 175 g argon.b. If the temperature is 225 K, what is the pressure? Exercise 115. Calculate the pressure exerted by 0.5000 mole of N2 in a 1.0000-L container at 25.0°Ca. using the ideal gas law.b. using the van der Waals equation.c. Compare the results.Calculate the pressure exerted by 0.5000 mole of N2 in a 10.000-L container at 25.0°Ca. using the ideal gas law.b. using the van der Waals equation.c. Compare the results.d. Compare the results with those in Exercise 115. A person accidentally swallows a drop of liquid oxygen, O2(l), which has a density of 1.149 g/mL. Assuming the drop has a volume of 0.050 mL, what volume of gas will be produced in the person’s stomach at body temperature (37°C) and a pressure of 1.0 atm? Consider two separate gas containers at the following conditions:How is the pressure in container B related to the pressure in container A? If 1.47×10−3 mol of argon occupies a 75.0-mL container at 26°C, what is the pressure (in torr)? A 75.0-g sample of dinitrogen monoxide is confined in a 3.1-L vessel. What is the pressure (in atm) at 115°C? A gas-filled weather balloon with a volume of 65.0 L is released at sea-level conditions of 745 torr and 25°C. The balloon can expand to a maximum volume of 835 L. When the balloon rises to an altitude at which the temperature is −5°C and the pressure is 0.066 atm, will it have expanded to its maximum volume? At 1450. mmHg and 286 K, a skin diver exhales a 208-mL bubble of air that is 77 % N2, 17% O2, and 6.0% CO2 by volume. (a) What would the volume (in mL) of the bubble be if it were exhaled at the surface at 1 atm and 298 K? Popcorn pops because the horny endosperm, a tough, elastic material, resists gas pressure within the heated kernel until the pressure reaches explosive force. A 0.25-mL kernel has a water content of 1.6% by mass, and the water vapor reaches 170°C and 9.0 atm before the kernel ruptures. Assume that water vapor can occupy 75% of the kernel’s volume. (b) How many milliliters would this amount of water vapor occupy at 25°C and 1.00 atm? What is the pressure of 2.01 g of nitrogen gas confined to a volume of 0.205 L at 36 oC? Liquid butane, C4H10, is stored in cylinders, to be used as a fuel. The normal boiling point of butane is listed as –0.5˚C. What volume does this much butane occupy at 751 torr and 36˚C? Hyperbaric therapy uses 100% oxygen at pressure to help heal wounds and infections, and to treat carbon monoxide poisoning. A hyperbaric chamber has a volume of 1430 L. How many kilograms of O2 gas are needed to give an oxygen pressure of 3.14 atm at 25°C? A 7.35-L container holds a mixture of two gases at 17°C. The partial pressures of gas A and gas B, respectively, are 0.168 atm and 0.630 atm. If 0.170 mol of a third gas is added with no change in volume or temperature, what will the total pressure become? A 0.203 g sample of carbon dioxide, CO2, has a volume of 564 mL and a pressure of 453 mmHg.What is the temperature of the gas in kelvins? Express your answer to three significant figures.What is the temperature of the gas in degrees Celsius? Express your answer to three significant figures. The nitrogen gas in an automobile air bag, with a volume of 60. L, exerts a pressure of 858 mm Hg at 25 degree C. What amount of N_2 gas (in moles) is in the air bag? A sample of a gas mixture contains the following quantities of three gases. The sample has: volume = 2.50 L temperature = 16.6 degree C. What is the partial pressure for each gas, in mmHg? What is the total pressure in the flask? A. A balloon is floating around outside your window. The temperature outside is 13 ° C, and the air pressure is 0.700 atm. Your neighbor, who released the balloon, tells you that he filled it with 4.50 moles of gas. What is the volume of gas inside this balloon? Express your answer to three significant figures and include the appropriate units.B. A 18.0 L gas cylinder is filled with 8.00 moles of gas. The tank is stored at 49 ° C. What is the pressure in the tank? Express your answer to three significant figures and include the appropriate units.C. A 240. L kiln is used for vitrifying ceramics. It is currently operating at 1335 °C, and the pressure is 1.075 atm. How many moles of air molecules are within the confines of the kiln? Express your answer to three significant figures and include the appropriate units. Dry ice is solid carbon dioxide, A 1.33-g sample of dry ice is placed in an evacuated 4.33 - L vessel at 21.0°C. Calculate the pressure inside the vessel after all the dry ice has been converted to CO2 gas. If 60.5 moles of an ideal gas is at 9.89 atm at 47.00 °C, what is the volume of the gas? What is the pressure in a 18.6 L cylinder filled with 20.4 g of oxygen gas at a temperature of 333 K? Express your answer with the appropriate units. A sample of carbon dioxide is contained in a 125.0 mL flask at 0.973 atm and 19.0°C. How many molecules of gas are in the sample? Enter your answer in the provided box.Given that 8.33 moles of carbon monoxide gas are present in a container of volume 26.10 L, what is the pressure of the gas (in atm) if the temperature is 47°C? A sample of carbon dioxide is contained in a 125.0 mL flask at 0.943 atm and 17.4 °C. How many molecules of gas are in the sample? A 50.0 L tank contains nitrogen gas at a pressure of 50.0 psi at 22°C. How many grams of nitrogen gas are in the tank? Do not include the units in your submitted answer. If 74.5 moles of an ideal gas is at 1.01 atm at 5.40°C, what is the volume of the gas? A sample of helium gas collected at a pressure of 0.976 atm and a temperature of 24.0°C is found to occupy a volume of 21.2 liters. How many moles of He gas are in the sample? An 8.85 L tire contains 0.525 mol of gas at a temperature of 319 K. What is the pressure (in atm) of the gas in the tire? Express your answer with the appropriate units. 0.976 mol sample of helium gas at a temperature of 24.0°C is found to occupy a volume of 21.2 liters. The pressure of this gas sample is ___ mm Hg. For 2SO2 (g) + O2 (g) ⇌ 2SO3 (g), Kp = 3.0 x 10 4 at 700 K. In a 2.00-L vessel the equilibrium mixture contains 1.18 g of SO3 and 0.107 g of O2. How many grams of SO2 are in the vessel?Express your answer using two significant figures. At a certain temperature and pressure, one liter of CO2 gas weighs 1.15 g. What is the mass of one liter of CH4 gas at the same temperature and pressure? What is the temperature of 0.43 mol of gas at a pressure of 1.0 atm and a volume of 11.7 L?Express your answer using two significant figures. If an ideal gas has a pressure of 3.61 atm, a temperature of 52.50°C, and has a volume of 79.31 L, how many moles of gas are in the sample? A 5.00 L flask contains 3.50 g of sulfur trioxide, 2.45 g of carbon monoxide, and 3.99 g of argon all at 35 °C. What is the pressure (in atm) in the flask? A 1.40 g sample of CO2 is contained in a 696 mL flask at 20.6°C. What is the pressure of the gas? What volume is occupied by 0.968 mol of CO2 at 274.7 K and 743 mmHg? If an ideal gas has a pressure of 2.93 atm, a temperature of 46.46oC and has a volume of 62.65 L, how many moles of gas are in the sample? A sample of oxygen was collected over water at 25°C and 0.852 atm. If the total sample volume was 2.950 L, how many moles of O2 were collected? A 8.20-L container holds a mixture of two gases at 31° C. The partial pressures of gas A and gas B, respectively, are 0.327 atm and 0.546 atm. If 0.100 mol of a third gas is added with no change in volume or temperature, what will the total pressure become? Enter your answer in thr provided box.What is the volume of 5.37 moles of an ideal gas at 35.5°C and 1.00 atm? If 6.01 moles of an ideal gas has a pressure of 1.43 atm, and a volume of 22.81 L, what is the temperature the sample? If 7.72 motes of an ideal gas has a pressure of 2.78 atm, and a volume of 33.67 L, what is the temperature of the sample in degrees Celsius? Enter your answer in the provided box.Given that 5.31 moles of carbon monoxide gas are present in a container of volume 12.10 L, what is the pressure of the gas (in atm) if the temperature is 55 °C? At what temperature do 0.026695 mol of Ne in a 893.7 mL container exert a pressure of 0.90 atm? lf 88.5 mol of an ideal gas occupies 86.5 L at 17.00 °C, what is the pressure of the gas? Carbon monoxide gas is collected at 31.0°C in an evacuated flask with a measured volume of 10.0 L. When all the gas has been collected, the pressure in the flask is measured to be 0.050 atm. Calculate the mass and number of moles of carbon monoxide gas that were collected. Round your answer to 2 significant digits. A weather balloon is inflated to a volume of 30.0 L at a pressure of 742 mmHg and a temperature of 29.9°C. The balloon rises in the atmosphere to an altitude where the pressure is 380. mmHg and the temperature is -13.6°C. Assuming the balloon can freely expand, calculate the volume of the balloon at this altitude. A 9.40-L container holds a mixture of two gases at 15°C. The partial pressures of gas A and gas B. respectively, are 0.327 atm and 0.665 atm. If 0.210 mol of a third gas is added with no change in volume or temperature, what will the total pressure become? A sample of argon gas collected at a pressure of 0.702 atm and a temperature of 291 K is found to occupy a volume of 653 millimeters. How many moles of Ar gas are in the sample? If 75.5 mol of an ideal gas occupies 88.5 L at 71.00 °C, what is the pressure of the gas? A sample of xenon gas collected at a pressure of 1.50 atm and a temperature of 275 K is found to occupy a volume of 860. Milliliters. How moles of Xe gas are in the sample? At what temperature will 2.55 mole of an ideal gas in a 1.30 L container exert a pressure of 1.10 atm? Part AIf the pressure exerted by ozone, O3. In the stratosphere is 3.0 x 10-3 atm and the temperature is 251 K, how many ozone molecules are in a liter? Express your answer using two significant figures. What is the volume of 5.60 g of O 2 at 7.78 atm and 415K? If 29.5 mol of an ideal gas occupies 13.5 L at 79.00°C, what is the pressure of the gas? A 22.4 L high pressure reaction vessel is charged with 0.3910 mol of iron powder and 1.20 atm of oxygen gas at standard temperature. On heating, the iron and oxygen react according to the balanced reaction below. 4Fe (s) + 3O2 (g) → 2Fe2O3 (s) After the reaction vessel is cooled, and assuming the reaction goes to completion, what pressure of oxygen remains? To identify a diatomic gas (X2), a researcher carried out the following experiment: She weighed an empty 1.1-L bulb, then filled it with the gas at 1.90 atm and 24.0°C and weighed it again. The difference in mass was 2.3 g. Identify the gas. Express your answer as a chemical formula. If an ideal gas has a pressure of 4.29 atm, a temperature of 457 K, and has a volume of 60.27 L, how many moles of gas are in the sample? lf 8.28 moles of an ideal gas has a pressure of 1.57 atm, and a volume of 87.35 L, what is the temperature of the sample in degrees Celsius? Enetr your answer in the provided box.A sample of nitrogen gas in a 2.7-L container at a temperature of 17°C exerts a pressure of 5.1 atm. Calculate the number of moles of gas in the sample. If 1.65 moles of an ideal gas has a pressure of 2.56 atm and a volume of 81.95 L, what is the temperature of the sample? If 4.33 moles of an ideal gas has a pressure of 3.14 atm, and a volume of 76.85 L, what is the temperature of the sample in degrees Celsius? In an experiment reported in the scientific literature, male cockroaches were made to run at different speeds on a miniature treadmill while their oxygen consumption was measured. In one hour the average cockroach running at 0.08 km/hr consumed 0.8 mL of O2 per gram of insect weight at 1 atm pressure and 24 oC.How many moles of O2 would be consumed in 1 hr by a 5.3 -g cockroach moving at this speed? A mixture consisting of 7.0 g of CO and 10.0 g of SO 2, two atmospheric pollutants, has a pressure of 0.33 atm when placed in a sealed container. What is the partial pressure of CO? Consider the flasks in the following diagrams.a. Which is greater, the initial pressure of helium or the initial pressure of neon? How much greater? A deep-sea diver uses a gas cylinder with a volume of 10.0 L and a content of 51.3 g of O2 and 32.7 g of He.Calculate the partial pressure of each gas and the total pressure if the temperature of the gas is 19 oC. A sample of an ideal gas has a volume of 3.60 L at 14.40 C and 1.80 atm. What is the volume of the gas at 24.20°C and 0.988 atm? The graph shows PV/RT for carbon dioxide at three different temperatures.Rank the curves in order of increasing temperature. The volume of an automobile airbag was 66.8 L when inflated at 25 °C with 77.8 g of nitrogen gas. What was the pressure in the bag in kPa? Complete the following table for an ideal gas: P V n T 2.10 atm 1.30 L0.510 mol? K0.320 atm0.260 L? mol32 oC660 torr? L0.334 mol360 K? atm585 mL0.260 mol290 KComplete the fourth row of the table. If you measure pressure in bars instead of atmospheres, calculate the corresponding value of R in L -bar/ mol -K.
Acrylic acid (CH2=CHCOOH) is used to prepare polymers, adhesives, and paints. The first step in making acrylic acid involves the vapor-phase oxidation of propylene (CH2=CHCH3) to acrolein (CH2=CHCHO). This step is carried out at 330°C and 2.5 atm in a large bundle of tubes around which a heat-transfer agent circulates. The reactants spend an average of 1.8 s in the tubes, which have a void space of 100 ft3. How many pounds of propylene must be added per hour in a mixture whose mole fractions are 0.07 propylene, 0.35 steam, and 0.58 air? A scuba divers tank contains 0.29 kg of O2 compressed into a volume of 2.3 L.Calculate the gas pressure inside the tank at 9 oC. If 3.63 moles of an ideal gas has a pressure of 1.25 atm, and a volume of 77.29 L. What is the temperature of the sample in degrees Celsius? If an ideal gas has a pressure of 6.07 atm, a temperature of 10.42 °C, and has a volume of 69.83 L how many moles of gas are in the sample? Suppose two 200.0-L tanks are to be filled separately with the gases helium and hydrogen. What mass of each gas is needed to produce a pressure of 2.70 atm in its respective tank at 248°C?